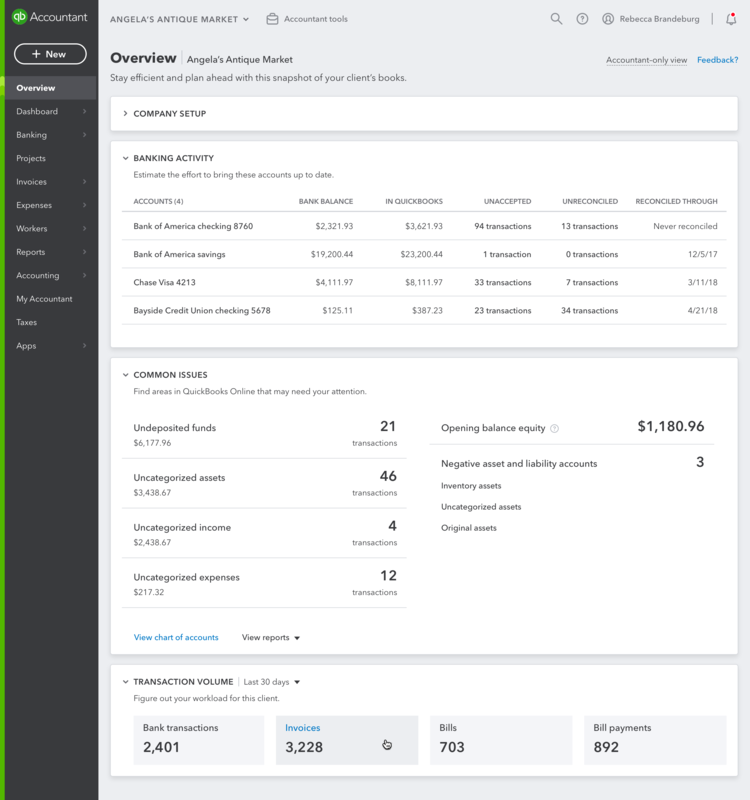 Client Overview (Overview Tab) is an accountant-only view inside a client’s QuickBooks Online file that allows accountant to confidently engage with their clients through access to important client QuickBooks details on the company set up, banking activity, and common issues. Log in to your QBOA account. (Or find the client then select the QB logo under the Status column. Once in the client file, select Overview from the left menu. Provides important details about your client’s Quickbooks subscription, whether or not they have payroll or sales tax enabled. In addition, you’ll also see how many apps your client has connected to their Quickbooks so you can stay on top of how many things are feeding into their account. These features help you understand your client, so you know what to expect when working with them. Shows all of the bank and credit card accounts connected to your client’s QuickBooks, the balances of each account, and all unaccepted and unreconciled transactions for each account. As an added benefit, we’ll also show you the last time they were reconciled all in one place. This helps you save time as you no longer need to go into each account and hunt and peck to understand the state of your clients books. Helps you get a better sense of areas in the client’s books that may need your attention. Highlighted in this section are Undeposited Funds and Uncategorized transactions which are the most common client pain points. When you select one of these tiles, it will take you directly to relevant register accounts or specific bank accounts, so you can do further investigations to understand the root cause. This feature can help you assess workload and account movements in the recent past. Will my clients be able to see this information? Who can see the Overview tab? Clients cannot see this, this view is only for accountants using QuickBooks Online Accountant. Is this view customizable? Can I choose what I want to show? Not right now. We have some ideas based on early feedback we’ve heard and will prioritize this feature at a later date. Yes, you can click on several places on this screen and it will take you to the area where you can do further investigations. What happens if my clients has nothing/no data in their books/account? If your client has an empty QuickBooks Online account, there will be no data on this page. Once you or your clients add any transaction or bank, the Overview tab will automatically populate the information real time. How often does the information on this page update? The Overview tab updates real time so whenever you make a change or do certain task the information will populate. The only part that may have some delays are the bank transactions, since this data will only reflect the last time you bank data was refreshed. The Overview tab should be available right now. You should go into a client’s book from your QuickBooks Online Accountant and the new tab should be there. How can I submit a feature request or feedback? There is a blue link called “feedback” on the Overview tab where you can leave your requests. Can I use this on my tablet or phone? Of course! We’ve optimized this for all types of devices. We want to ensure you are able to check in on the state of your clients books wherever and whenever it’s most convenient for you. From the beach, elevator to your desk...we got your back!